I guffawed. An actual guffaw. Ah yes! I only have two problems when it comes to knitting: I obviously can’t read (directions) and I can’t count worth beans! You’re in good company. Hardest part about knitting is counting…..even when my husband doesn’t shout out random numbers to throw me off. I clearly remember my sister and I doing that to my mother and thinking we were the funniest kids in creation. Non knitters laugh at me when I say the hardest part is the counting, and that often it’s counting to numbers under five that really throws you. They think I’m joking. I am not. I was struggling with reliably making it to three the other day and my sister has informed me that the part of k2p2 ribbing that really makes it sing is when you jazz it up with a k7. Yes it does jazz it up, that is for certain…ripping back here as well. That sweater is so cute 😀 Meg and mystery grandson will both love it, I’m sure. Here I am with a girl/boy bootie comment. I found for a long time that I needed to know girl/boy. You know like for those incredibly androgynous-looking people? It bothered me that I couldn’t tell. Then I applied the Business Analyst trick of asking “Why?”. Why do I need to know? Do I really treat people differently (unfortunately, probably so) But, no, there should be the same respect, wear whatever clothes one wishes, etc etc. I finally came down to, “Well, it’s awfully nice to know who gets off the elevator first.” And that was about it. So now I don’t care, but still do a double-take when someone who looks quite feminine from the back (long skirt, long hair) turns around and has a full beard and mustache. Can’t help it. My engineer friend has a little boy. He wears truck shirts because she likes trucks and always has. She is a bit worried that she’s put him in the “boy rut” because of it, but then, he’s only 2 so doesn’t care what he wears. It’s a conundrum. Oh, and I like the little sweater. It’s lovely. My little boy has a pink car seat because I love the caravans and beetles it’s covered in! Who cares?! And he has a beautiful hand crocheted blanket in pink! When I look at most of his clothes they’re boring blue and grey so I try to buy bright greens and oranges wherever possible! That sweater is darling. But what about the rest of the Christmas knitting? Curiosity is killing me! Me too! I have been checking back diligently to see it. Thank you reminding me about Tulips. I admired it last time you mentioned it, but at the time, there was no baby in the offing. Now, my oldest friend is about to get her first grandchild, so I’ve just bought the pattern. I would like to contribute to that study too. It turns out that establishing a simple lace pattern in groups of 3 stitches requires more concentration than I can muster until I’ve ‘practiced’ a couple of times. I adore the rainbow socks (for girls and boys) – and adore this sweater! For me – counting can be an issue – especially when I’m watching The Price Is Right at the same time – LOL! I agree. Treated myself to yarn for a poncho (saw it at Rhinebeck and couldn’t resist). The colors, though muted, are scrumptious! But it’s not earth/autumn tones! It’s – sigh – my colors of blue and grey! Gonna be lovely……..You get me into so much trouble…..
That yarn in the bottom pictures looks so soft! I want to rub it around on my face, lol! I’ve learned I’m incapable of counting to 4 while knitting. I can do 3. I can do 5. I can do 2 or 6. The little sweater is gorgeous. I’ve heard babies respond best to bright colors, so I’m sure Impending Grandson will love it! How many hours a day do you knit??? Yes. I took and efficiency knitting class with her. The fastest in our class was 33 sttiches per minute (we tested it over like 4 or 5 minutes). Her count is 60 per minute watching tv. She does a cool little throw with very minimal movement. It’s quite efficient. 🙂 That helps a lot in finishing things. I’m certain you would have plenty of test subjects for your study…myself among them. Is it the wool fumes? Are we hypnotized by the colors or the pictured finished object dancing through our brain? Once I’m into about the 3rd row of ribbing when I can actually SEE the pattern happening, then I can sip and visit. Perhaps it’s because I live where winter is 3/4ths of the year or because we want to share the very best of our world with new humans, COLOR, yes, lots of it, for the new ones. Rainbow feet to kick up in front of your new eyes, multicolored arms to wave about, yes, yes and more yes. We ALL could use rainbow sox for some portable happy in our lives. Two friends recently announced they were pregnant and rather than ask the expected gender , I now ask “what color would make you happy to see your little one in?”, because if the parents are wearing their happy faces, the baby will too. It is inherent in our DNA to classify and sort the world around us…perhaps originally into levels of expected safety. As our world shifts and evolves around us, the categories and labels will as well. I am ever hopeful that ‘fiber friendly’ (knitter, crocheter, spinner, dyer, farmer, somewhere in and around these, participant or admirer of the prior terms) never becomes extinct. As well as “open-minded”. WHAT A FAB IDEA!! I am totally stealing this from here on out. And I just now used it today. Dad said earth colors as they are doing a woodland themed nursery Oh, and orange. LOL – I love it. You are my Hero in Life. The problem with counting to 4 is it is an even number. odd numbers give you a half way point to realize that there is a problem. The rugged individualist in you cannot fathom the pairness that even numbers try to promote. Not being able to count an even number just makes you realize how much of an individual you are. Also, it gives you way more time to enjoy the yarn since every garment gets knitted at least twice. I am not a knitter but a tapestry weaver. In an early project I learned that I was not able to consistenly and correctly distinguish between 1 and 2. The little sweater is adorable and I LOVE the rainbow socks-reminded me of my wonderful nephew, whose childhood favorite colors were neon pink and neon yellow-I made him many shirts and shorts in those colors and he was alwYs easy to find in public. And I love love love love love the Grus! If I didn’t already have projects to last me through 2057, I would definitely put it in my queue! Counting is my-oh, look, SQUIRREL! Yeah. Counting is hard for the easily distractable! My current project (6 rows and I will be casting off) is a lace trimmed shawl. I have a 6mm jump ring marking each repeat. If the pattern repeat doesn’t line up with the jump ring I know exactly where the mistake is! 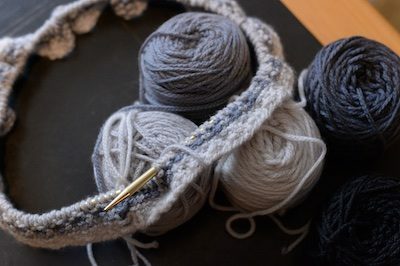 I love the wee rainbow garb you’ve been making, but I am not surprised you’ve cast on a (lovely) grey piece. There’s something hypnotic about this time of year that pushes us towards more ‘dreary’ colors. I spent a few minutes in the comments last night as well. It is refreshing to see a comments section that isn’t reduced (except for a very small minority) to infighting. Anyway, good luck counting to four. I know I’ve struggled with that a fair bit as well. My knitting has me counting to six these days. After one long weekend afternoon, I went for a walk and found myself still counting, even though I wasn’t knitting! As a musician I have learned to count 2s, 3s, 4s and 6s subconsciously. It is just a part of the rhythm of life. But when I have a 5, 7 or heaven forbid 10 stitch pattern repeat, I feel the same way. I can count with music, but not with knitting. No idea why. Though 7/8 is my favorite time signature! It has a delightful off kilter shimmy in it that just makes me grin. I love your color choices for the sweater. I see earth and crops, water, flowers and sky with clouds. Just lovely! Ooooh, and so much more wholesome than my initial reaction–which was to burst out in a giggle that some of Stephanie’s very favourite colours (autumn-y) have made an early appearance…good to get the fellow accustomed from the start, for sure!! Mmm, I love that frothy cozy look that cowl is getting. That’s going to be a lovely little thing. Knit, then you can buy more. Knitted Tulips years ago, after you blogged about it, and I love that pattern! I don’t knit a lot. I’m working on a sweater with yarn I’ve had for ten years. Third design I’ve tried. I think this is the one! Currently shaping the neck and the armhole. Had to make a chart and mark the various decreases row by row. You know, do this every fourth row and that every second row. Can’t keep that in my head. Checking off the rows on the chart as I go. Am I the only one? No, I go over every chart coloring SSK one color, and K2TOG another color, cable stitches are colored in so one set of the cable stitches are one color from top to bottom, while the other half of the cable is another color..then a glance at the chart tells me over or under = front or back cross. The rainbow sweater is fabulous and the little guy who wears it will look extra darling. A friend recently griped to me about the “agenda” that has been attached to the rainbow motif in the political/cultural milieu. I said, “huh? what agenda?” and she clarified her POV. I said “huh” again then replied that rainbows belong to everyone and the best way to counter her “gripe” would be to put rainbows on everything everywhere. 🙂 She was not best pleased. Oh well. 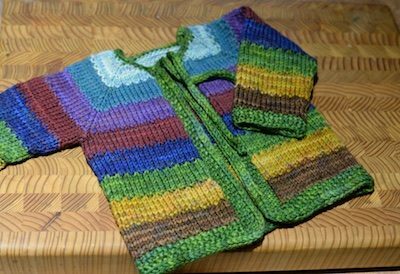 I’m imagining myself wearing an adult-sized rainbow Tulips sweater, perhaps knit from lett lopi. Rainbows for everyone! I once had to do a medical test related to an inner ear issue. It involved lieing backwards with the head inclined downwards, having water syringed into my ear while being asked to count backwards by fours. Probably a similar issue as far as the brain is concerned. My Japanese mother always told me that 4 (or things that come in 4’s) is bad luck. Something about it being a homophone for death or something like that. Anyway, glad you got it worked out! Rainbows are for everyone! Especially when winter is at its darkest and greyest. Perfect choice for a winter sweater. Anyone who thinks that a color is specific to a gender hasn’t read history. If I recall mine correctly, pink was a “boy” color and blue was a “girl” color until the mid 1900’s. Thing 1) I’ve been reading your blog (almost) since the beginning. Thing 2) Unsolicited advice is one of my pet peeves, and I am a gigantic hypocrite for saying what I am about to say…BUT, please refer to Thing 1. Don’t put off starting The Blanket for too long. I’m pretty sure we’ve all been thinking that, so thank you for saying it. I’m thinking the Tulips sweater may represent procrastination. I’ve made one. Super entertaining. When I’m knitting with Woolfolk, I don’t need an antidote so much as an insulin shot. That stuff is CANDY! Also, when I read the end of this blog post, I swear I said “1. 2. 4.” in my head. I went to MIT and I don’t know what’s wrong with me. One of my math professors in college told us that “There are three types of mathematicians – those who can count, and those who can’t.” Evidently it applies to knitters, too! Woolfolk! My favorite doctor retired and I knitted a cowl for the new one out of Woolfolk because I wanted to start off on the right foot with her. She was a knitter. She absolutely swooned over how soft it was. It was the perfect thing. Enjoy! Love the Tulips sweater, too–thank you for the inspiration! I feel your pain. I have a pattern currently in exile for a lovely beaded scarf. Why did I exile it? Because I can’t count to six. 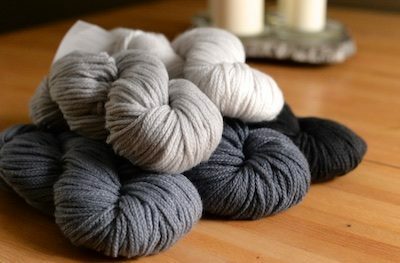 By the way, what do I do to make money to buy yarn? I’m an accountant! 6 = 2 x 3; might make it easier. Didn’t you take the required class, Embezzlement 101? If it makes you feel better, I’ve tinked and frogged NINE TIMES already on the first two row repeats of the Wolf River pullover. I agree, counting is hard. Only knitters understand this. I never get sick of knitting Tulips sweaters! I “discovered” Woolfolk on a recent trip…yummy yummy yummy. The cowl will be amazing. You really are a Love, know that? No wonder you lost count – that is one charming, rocking video from The Boss! Quite often, knitters are counters, ie: when I walk, climb stairs, put dishes away, sort through something, I am constantly counting, usually in repeats of 3,4,5…I heard years ago that this is a knitter thing, to always be counting. So, if this is the case, why can’t I count when I’m actually knitting?? The sweater is lovely, the colors are beautiful and perfect for a little person! I have been trying to stay away from cowls as a money saving strategy, and you don’t make it easy. This one is definitely tempting…! I did a double take when I saw Får, Far is the Danish word for Dad, what I called my father until I became Americanized (moved to USA at age of 8). 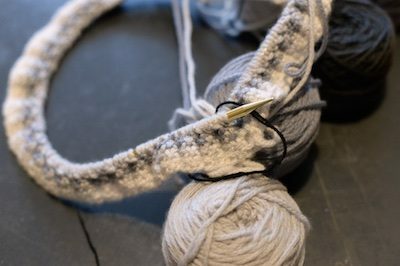 My brain can count – it can count “Knit Two, Purl One” while carefully purling two and knitting one. Or knitting one and purling two. Or whatever. It’s like my subconscious thinks the pattern is some kind of incantation that will make the yarn form the desired shape, completely independent of the movement of my hands. thank you fo r putting it so eloquently! Well said…a friend that doesn’t knit was watching me navigate a tricky section…intent focus and stating the pattern out loud. When I finished she said, “you keep saying knitting is easy-so all I have to do is hold the yarn and needles and read them the pattern? Are those magic needles expensive?” Lol. Needles look like wands for a reason, right? Why isn’t there a simple “LIKE” button on your posts? It would make things so much easier! Once again, I LOVE this baby sweater and finally have an excuse to knit it (there is a fat little 13 week old grand nephew in my family that I adore). I’ve been making themed hats for him- a pumpkin, a turkey, and a reindeer; but now I’m ready for something else. Another thought about rainbows and their colors — In the Bible the rainbow is a symbol of God’s promise to humans to never again destroy the earth with a flood. We could expand on that idea to say that the rainbow, in all its lovely colors, symbolizes mercy and hope. I think we can all embrace those ideals. My partner takes great joy is pointing out how I can’t count to 4, because my knitting often requires that number and sees me cursing repeatedly under my breath for just that blasted reason! Sigh. And yay for bright, little people clothing! …I must ask: do you do the gendered button band thing? When I worked in the yarn shop sometimes older women would make comments about stereotyped color stuff based off the buttons. It blew my head that anyone could keep that kind of stuff in their head since every.single.time. I go to do a button band I have to put things down and use my hands to remind myself how I find it easiest to do them up. For my cardigans, or my toddlers. And really, ability to put on/take off overrides gender on where I’m putting my buttons. I am continually astounded that I cannot do something as simple as count to 4 (or even 2, sometimes)! It must be a knitting-related illness. My trick for counting to 4 while distracted or impaired (like that happens 🙂 ) is to put stitch markers at some multiple of 4, such as every 20 stitches, etc. Then if I get to the stitch marker and the repeating pattern is wrong I know I made a mistake only 20 stitches back. Of course, this doesn’t work if the pattern shifts over more than 20 stitches. But you can choose a number that works for the pattern. it saves a lot of swearing. I realized this weekend that my two year old grandson can count more reliably with his blocks than I can with my knitting! Love the Tulip sweater! I just finished my forth one. Alas, Dream in Color changed its Classy yarn in 2014. DIC calls the new Classy a worsted weight but it is more of a DK weight. I purchased one skein of the new Classy skeins to use in my most recent Tulip but I couldn’t use it with the old Classy left overs that I had. The new Classy looks beautiful but I wish it was a heavier weight. I enjoy knitting baby things. I’m looking forward to seeing what additional things you will knit for your grandson. That discussion stayed in my head for days, and really had me evaluating how I express myself and how my head and heart respond to other vantage points. Thank you for that. And bring on the baby knitting! I’m in “the more colors on all of us the better the world is” corner. After all God (or your Supreme Being of choice) created rainbows for us way back in Genesis, Chapter 9, Verse 13 (or thereabouts). Keep on spreading rainbows happy grandma-to-be! Hah! Let me know the results of your study– I’d like to figure out my own psychology. I also make weird counting/arithmetic gaffes while cooking. I’m working on a shawl for my girlfriend and forgot to strike out the line I had completed on the chart, so lost my place and had to count my stitches…and counted 3 times and came up with 3 different counts. Fourth time I got a matching number, unfortunately not the one on the chart, so where to decrease a stitch because I don’t know where I added on. Fortunately the pattern is forgiving and I just dropped an increase. Yes, rookie mistakes. These results are, of course, a design feature!! I was just thinking again of your Rainbow Boy. In the 1800’s and early 1900’s ALL babies were in mostly pink and dresses. It unfortunately did NOTHING to help feminism. Maybe pink association for girls was to keep us infantised. That we need men to care for us. Just a thought. He is one lucky Rainbow baby! Want a little counting therapy to stimulate the limbic brain (your happy place)? 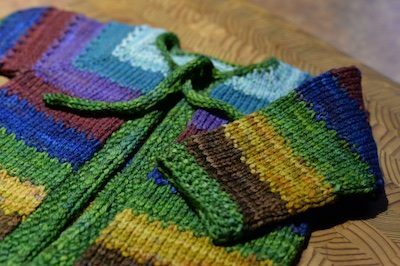 Try Cecelia Campochiaro’s Sequence Knitting patterns. Do it in rainbow colors and I’m convinced you will be positively giddy! Counting is stupidly hard. I was trying to do decreases for a hat a few weeks ago and had to tink back way too many times, and I don’t think I was watching TV or anything. I love that Tulips sweater – but surprisingly only when you knit it. When I try to crank one out, it doesn’t look as good and I am disappointed with it. Kind of like when I try to make my Mom’s potato soup but somehow since she didn’t make it, it tastes wrong even though we’re using the same recipe. In other words, knit more Tulips sweaters! I love when you do! Signed – another person in huge favor of Rainbows for everyone! I love that sweater and will knit one for my incoming grand niece or nephew :). I do like how the color madness in that sweater. The cowl yarn is scrumptious looking. Thanks for pulling me back to earth. I’ve been spending too much time and emotional energy on social media these weeks. I needed some lovely knitting to reground me. Going to hug my rainbow-loving boy and his sister now. The Blanket! The Blanket! Not a moment to lose, I can’t take the stress of another near miss! Here is a lovely rainbow blanket for your grandson. I knit this a couple of years ago. It was a really fun knit and the recipients loved it. I changed up the pattern a bit by alternating the color order of the wedges in each pie. I think its a right brain, left brain thing. Tulip is so fun to knit. I’ve knit many many ones myself and kind of look around desperate for another baby to knit one for. Man, counting in knitting is too hard. Compounded for me by having three small boys (who wear all the colours, and play with dolls and lego and cars), and therefore being perennially tired. And having to stop every ten minutes to get someone a snack. Can’t keep count through that! Often I have trouble setting up a 2 x 2 rib, wich means I cannot count up to two, not mention know my right from my left… in knitting. The study would be fascinating,at least I hope so. Doesn’t seem to matter how intelligent one is, counting to four consistently can be a challenge. The sweater is so happy! Color is the spice of knitting. I recently read a fabulous review of psychology studies on ‘repetition suppression.’ Which is when neural activity (I call it concentration on task) reduces towards a repeated task. Especially when any other stimuli are present. Even when we think we are concentrating, it can be hard to continually repeat the same task – counting to four. 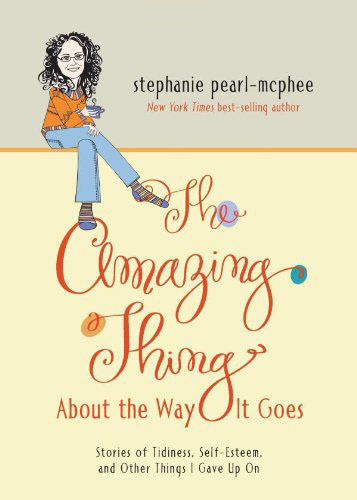 Unless we are really really giving it everything we’ve got – and then some. I’ve taken to using stitch markers for every single set of repeats in the first few rows – or at least in sets (10 or 12 stitches). Means I have hundreds of stitch markers – and the first rows take forever. But it makes the math easier for me. I remove the stitch markers after a few rows. I have that counting when knitting problem all the time. And here I thought it was my age. Nice to know that it’s pretty common. I had my pair of Hermione’s Everyday Socks at Little Man’s swimming lesson last night. It’s a four stitch, four row pattern repeat. I could not count to four on the rows needed (1 & 3). I could count the rows fine but I found myself more than once knitting a stitch I should have been purling. ::sigh:: I know I can count to four. Before I read the blog I said to myself “Gee that looks a lot like a tulip sweater” and indeed it was. Love those and really like your latest. A kit? The biggest challenge for me was picking out the colors. Just didn’t like what I picked after a while and quit the sweater. Gosh, it makes me feel better that even the “pros” can’t count sometimes! I can be knitting along just fine and suddenly lose my mind and can’t count correctly. My mind wanders off to something else or my husband decides he needs to talk to me. 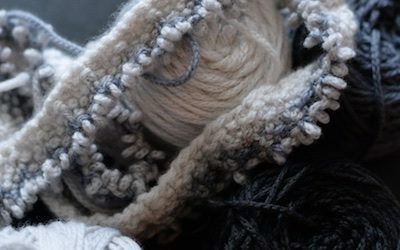 Can’t wait to see the cowl you are making with that wonderful Woolfolk yarn. It is one of my absolute favorites! So marvelously soft and it knits up like a dream. Enjoy! So, essentially, multiple strikes can happen at the same place in this short period of time. A thanksgiving discourse, for recent military successes, delivered in the Third Congregational Church, New Haven, September .